"I came that they may have life, and have it abundantly (John 10:10). Preach the word, be urgent in season and out of season, convince, rebuke, and exhort, be unfailing in patience and in teaching (2 Tim 4:2). Celebrating Mass at the tomb of St. Francis of Assisi with a pilgrimage group in October 2016. 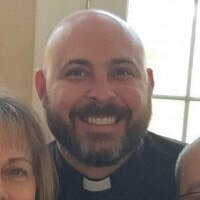 I am a former golf professional turned priest. I played college golf at Southern Illinois University. After college, I was a club professional in Evansville, Indiana and West Palm Beach, Florida. During my time in college, I fell away from the practice of my Catholic faith. My personal life hit rock bottom in Florida. I was living the way of the world and I was miserable. ​I moved to Batavia, Illinois to be closer to family and get a new start. Being close to Mom meant I started going back to Mass. About one and half years going back to Mass, I thought I should find a good Catholic girl to marry. I met a young lady in a nearby town and she invited me to a young adult group. When I showed up for the group, only a few days before Christmas, I quickly discovered that it was a parish penance service (you know, the thing with 10 priests sitting around the Church with Gregorian Chant playing in the background). At this point, I had not been to confession in about 15 years. I figured everyone else was going, so I should. God works with even the weakest of intentions. I have to say that was the watershed moment of my life. After that I began to vigourously study my faith. I began going to daily Mass a few months later during Lent and doing a Holy Hour everyday in the Adoration chapel. It has been an amazing journey so far, and I cannot wait to see what God has in store. ​You can listen to my conversion story here starting at the 29:05 mark. I was ordained a Priest of Jesus Christ 22 June 2013 by Most Rev. David J. Malloy for the Diocese of Rockford. I am currently a parochial vicar at St. Bridget Catholic Church in Loves Park, Illinois. I love every minute of being a priest.